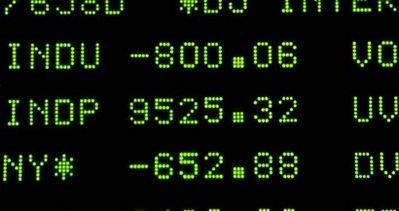 Markets Routed in Global Sell-off [Oct 6] Stock prices collapsed around the world on Monday amid growing fears that the credit crisis would trigger a global recession. The FTSE Eurofirst 300 index had its third worst day ever, plunging 7.75 per cent, as France's CAC 40 slumped 9 per cent, its second worst day on record. In London, the FTSE 100 suffered its biggest one-day points loss. The Dow Jones Industrial Average closed down 3.6 per cent at 9,955.50 after falling as much as 7.75 per cent, to 9,525.32, during the day. Trading was temporarily stopped in some major emerging economies, including Russia, where the market fell by just over 19 per cent, and Brazil, where stocks fell as much as 15 per cent before closing 5.4 per cent lower. Earlier, Japan's benchmark Nikkei 225 index plunged 4.3 per cent to a 4½-year low. Jakarta suffered a 10 per cent drop. Frantic to avoid the mistakes made during the Great Depression, central banks and governments around the world are pumping liquidity into their banking systems - inflation dangers be damned. Will this work? It can't hurt, but the overall cycle will not change. Where this current cycle is blamed on the subprime mortgage mess, the big lie where mortgage backed securities were packed with sure-to-fail mortgages but labeled as prime mortgage securities, there were many other causes for this economic downturn. We stated almost a decade ago that the world was heading into a depression, and this was based on an analysis of what business had to deal with as the Earth changes started to bite. For one, crop failures were about to occur, caused by the erratic weather, swings of drought and deluge, rainstorms drowning crops and intractible droughts frying crops beyond the hope of recovery. Frosts come late and warm winters mocked an early spring, destroying crops such as tree fruit and winter wheat. The effect is an increased price of food, worldwide, due to shortages and the need to replant and pay higher insurance premiums. Money spend on food is diverted from other commodities, squeezing markets. Second, physical damage to business and industry during earthquakes and storms have been on the uptick. Snapping fuel and chemical delivery lines caused factory explosions, city streets imploded when steam vents were broken, and buildings slumped into sinkholes. Where this has been treated as individual disasters by the media, rather than a trend, the effect of this steady drip of disaster on business and industry is expense so that bankruptcies are on the increase. This then results in job loss - unemployment and loss of a tax base. Third, the Bush administration deliberately bankrupted the US in order to support their oil grab in the Middle East. They knew the pole shift was coming, but did not have a firm date other than our White Lie stating that the pole shift would occur "shortly after May 15, 2003". Thus, the invasion of Iraq just months ahead of that date. Their determination to remain in Iraq, to eventually invade Saudi Arabia and Iran, created a massive financial drain on the US. By spending on the war in Iraq, the Bush administration was not spending on boosting the US economy. Job loss and bankruptcies continued, ignored. Fourth, the housing bubble, deliberately promoted by the Republicans and the Bush administration in order to confuse the world and especially the American people about the financial state of affairs. To maintain the war in Iraq, a façade of financial health was needed so the American people would not rebel. In the short term, the construction industry boomed. But all bubbles burst, and when they do the impact is worse than what was gained because it takes a long time to regain confidence, a necessary ingredient for a humming economy which is essentially based on trust. Despite the steps taken to encourage business and industry, to provide capital, and to provide new job starts, the underlying problems with Earth change disasters and the expense of merely putting food on the table will continue. A wise leader can turn this tide by encouraging alternative energy from wind, food from family gardens and cheap protein from fish ponds, and public service by unemployed youth. These steps make for a smoother transition to the survival communities of the future, after the pole shift. The drop from the boom times of the past, when Wall Street was king and living on hot air, will continue. Deflated, the world will have to address the true state of affairs, or at least will be forced in this direction. In Iceland, the currency fell 30 per cent. The Australian dollar slumped by nearly 10 percent Monday. Americans' retirement plans have lost as much as $2 trillion in the past 15 months _ about 20 percent of their value _ Congress' top budget analyst estimated Tuesday as lawmakers began investigating how turmoil in the financial industry is whittling away workers' nest eggs. More than half the people surveyed in an Associated Press-GfK poll taken Sept. 27-30 said they worry they will have to work longer because the value of their retirement savings has declined. The fear is well-founded. Public and private pension funds and employees' private retirement savings accounts - like 401(k)'s - lost about 10 percent between the middle of 2007 and the middle of this year, and lost another 10 percent just in the past three months, he estimated. European stocks shed early gains Tuesday as ongoing fears about the health of the banking system, particularly in Britain, offset hopes that the world's leading central banks will follow Australia's lead and cut interest rates aggressively. RBS was not the only British banking stock in trouble amid news reports that the chief executives of Britain's largest banks met up with British Treasury chief Alistair Darling and Bank of England governor Mervyn King Monday night to discuss the possibility of the government providing funding in exchange for stakes in the banks. The Reserve Bank of Australia surprised markets when it slashed its key rate a full percentage point to 6 percent -- its biggest cut since 1992. Fed Joins 5 Central Banks - Cuts 1/2 point and Cites 'Intensification' of Crisis. The Federal Reserve, working in coordination with other central banks worldwide, enacted an emergency interest rate cut. The Fed lowered its fed funds rate by a half percentage point to 1.5%. The central bank's statement said the move was necessary because of the worsening crisis in global financial markets. The fed funds rate is the central bank's main tool to affect the economy. Lowering the rate pumps money into the economy by reducing the borrowing cost on a broad range of loans, including credit cards, home equity lines and many business loans. The moves were made in coordination with other central banks around the world including the European Central Bank and Bank of England. The Swiss, Canadian and Swedish central banks also made cuts. Across Europe, governments followed Germany's weekend move to guarantee retail savers' deposits, with similar steps taken in Denmark, Sweden and Austria. Chancellor Angela Merkel has been forced to pull her head out of the sand, guaranteeing all German savings, a day after she rebuked Ireland for doing much the same thing. During the past week, we have tipped over the edge, into the middle of the abyss. Systemic collapse is in full train. The Netherlands has just rushed through a second, more sweeping nationalisation of Fortis. Ireland and Greece have had to rescue all their banks. Iceland is facing an Argentine denouement. To help ease credit stresses, the Fed announced Monday it will provide as much as $900 billion in cash loans to banks. Most of the loans are for 28-days and 84-days. Some are shorter, 13-day and 17-day loans.